Two black bags of trash dumped along the road in the 5000 block of Redwood Road. They are hard to see from the road. OAK 311 has received this issue. Your service request ID is #895732. Please check back for status updates, or contact us directly at 510-615-5566. The City of Oakland addressed this issue on 04/17/2019, service request #895732. OAK 311 has received this issue. Your service request ID is #896439. Please check back for status updates, or contact us directly at 510-615-5566. It asap as it is causing traffic issues as we live in a very narrow street. OAK 311 has received this issue. Your service request ID is #895856. Please check back for status updates, or contact us directly at 510-615-5566. Good luck with ASAP there have been more 1100 reorts of abandoned vehicles reported on SCF since March 17 2019 in Oakland. The last one I reported there auto response was it would take at least 40 days to get a 72 hour tow tag. A car accident damaged a metal fence in front of 4400 Redwood Road almost a year ago and it is yet to be repaired. There are metal spikes from the fence that could seriously injure someone if they stepped into them. OAK 311 has received this issue. Your service request ID is #846711. Please check back for status updates, or contact us directly at 510-615-5566. Here is a closer look at the spikes. OAK 311 has received this issue. Your service request ID is #895567. Thank you, in advance, for your patience as we work through a backlog of pothole service requests. Unfortunately the City does not have enough funding to repave all streets in poor condition. With limited funding, our response to resurfacing requests is limited to minor pavement and pothole repairs only. Our Street Maintenance Department will assess your street and determine whether temporary measures might be appropriate. Please understand that this work may be limited to pothole or other minor repairs, and that we have many similar requests. We will do our best to respond in a timely manner. The backlog of streets in Oakland needing pavement currently is $435 million and growing. There are a lot of dried up bushes and tree branches at the end of the church parking lot. They have been there for weeks and are a fire hazard. OAK 311 has received this issue. Your service request ID is #846808. Please check back for status updates, or contact us directly at 510-615-5566. Two large long potholes on northbound side. 2-3 feet long. Will cause vehicle damage. OAK 311 has received this issue. Your service request ID is #894903. Thank you, in advance, for your patience as we work through a backlog of pothole service requests. Unfortunately the City does not have enough funding to repave all streets in poor condition. With limited funding, our response to resurfacing requests is limited to minor pavement and pothole repairs only. Our Street Maintenance Department will assess your street and determine whether temporary measures might be appropriate. Please understand that this work may be limited to pothole or other minor repairs, and that we have many similar requests. We will do our best to respond in a timely manner. The backlog of streets in Oakland needing pavement currently is $435 million and growing. OAK 311 has received this issue. Your service request ID is #894634. Thank you, in advance, for your patience as we work through a backlog of pothole service requests. Unfortunately the City does not have enough funding to repave all streets in poor condition. With limited funding, our response to resurfacing requests is limited to minor pavement and pothole repairs only. Our Street Maintenance Department will assess your street and determine whether temporary measures might be appropriate. Please understand that this work may be limited to pothole or other minor repairs, and that we have many similar requests. We will do our best to respond in a timely manner. The backlog of streets in Oakland needing pavement currently is $435 million and growing. Mid 90s or 00s Grey Chevy Equinox with no plates and a big crack or bullet hole in the window. OAK 311 has received this issue. Your service request ID is #890607. Please check back for status updates, or contact us directly at 510-615-5566. 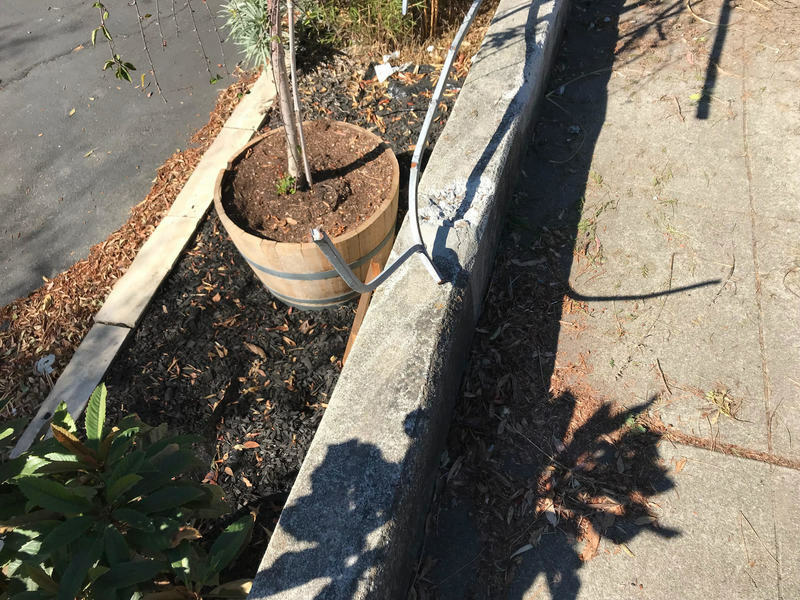 The City of Oakland addressed this issue on 04/11/2019, service request #890607. Mid 90s or early 00s gray Chevy Equinox with no license plates and a bullet hole in the windshield. OAK 311 has received this issue. Your service request ID is #890608. Please check back for status updates, or contact us directly at 510-615-5566. The City of Oakland addressed this issue on 04/11/2019, service request #890608.